The rubberized driver heads from Micaton are magnetic screw holders that make tasks much easier—and even one handed. A powerful neodymium magnet inside each driver head holds screws securely in place, which frees up your hand. The magnets are even strong enough to attract screws out of your tool box or bag, too. 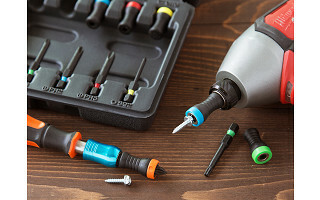 The heads (color coded by size) fit on power drills or manual tools, and Micaton has the standard bit and torsion bit sizes all covered with sets of 6, 10, or 18 pieces. The 18-piece kit also has a magnetic nail-holder that grips nails while you hammer, adding major convenience and a measure of safety, too. 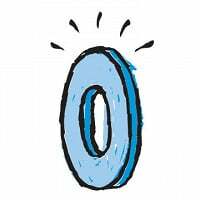 These small-but-smart solutions are easy to keep handy and are ready to lend a hand on your next project. Hello everyone! I'm proud to introduce Micaton to The Grommet. I'd be happy to answer any questions you have! Are the carry cases included? Will the magnetic holder work with regular drill bits? And is there a reason for the color coding? Will the holders and bits mix and match? The magnetic holder (Magnet Driver) works with regular power bits, not drill bits. Each colour code of Magnet Driver corresponds to the different diameter of the shank. - 1 yellow Magnet Driver® for screwdriver round rods diameter 1/8 "
- 1 green Magnet Driver® for screwdriver round rods diameter 3/16 "
- 1 blue Magnet Driver® for screwdriver round rods diameter 15/64 "
- 1 red Magnet Driver® for screwdriver round rods diameter 1/4 "
- 1 orange Magnet Driver® for hexagonal rods diameter 1/4 "
Each colour code of Magnet Driver corresponds to the different diameter of shank. 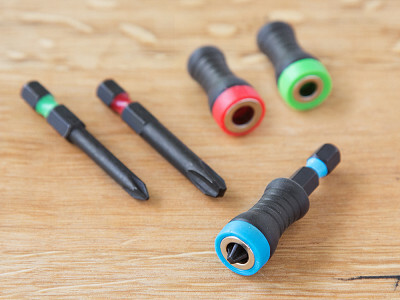 All our power bits are colour coded and it means that each powerbit has got a shank diameter that fits to the Magnet Driver holder with the same colour code. You can also use your own power bits paying attention to the diameter of the shank. Are all the screw drivers Philliphead? No straight head? The 6 pcs set has got 3 Phillips heads size 1, 2 and 3. The set 10 has got 4 Phillips heads size 0, 1, 2 and 3 + Square head size 2. The set 18 has got 4 Phillips heads size 0, 1, 2 and 3 + Square head size 2 + Torx heads size 10, 20, 25 and 30 + Pozidrive head size 2 and extra specil bit nail holder. We are currently developing the slotted (straight) head bits. What type of warranty is included with these bits? Our power bits are high quality and made of S2 hardened steel resistant to friction and torsion. They are color code and anti-corrosion finnished. Our clients confirms that with an appriopriate use our power bits are long leasted. Why two pieces - Why not just make the two parts into one? Do not see the logic. Why was the standard (straight) screw head not included. This the most used. 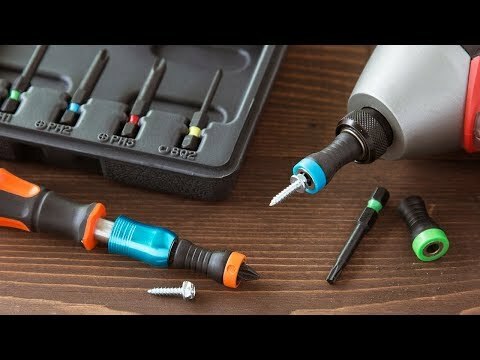 Our Magnet Driver is unique - you can use Magnet Driver with any power bits of any brand or later take it out from the power bit and put it on a hand screwdriver of any brand. We are currently developing the slotted (straight) head power bits. However you can put the Magnet Driver holder on your own hand slotted (straight) screwdriver. So instead of the bit being magnetic or the bit holder, as in other drivers, you have a sleeve that fits over the driver. Is that how the system works? Yes, Magnet Driver is an elastic sleeve with a neodymium magnet that fits over the power bit, or hand screwdriver. It is very easy to place it and it holds the screws straigher and firmlier comparing to the solutions like: magnetized bits or magnetic bit holders. Magnet Driver let you also countersink a wood screw, because of its compressible rubber body. This is why is so unique. The rubberized driver heads from Micaton are magnetic screw holders that make tasks much easier—and even one handed. A powerful neodymium magnet inside each driver head holds screws securely in place, which frees up your hand. 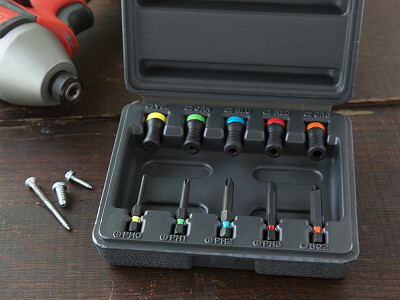 The magnets are even strong enough to attract screws out of your tool box or bag, too. 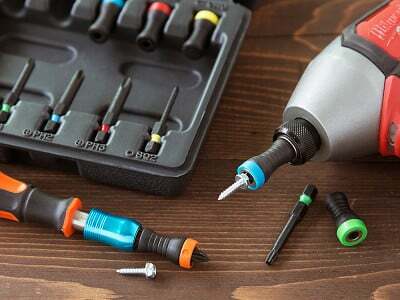 The heads (color coded by size) fit on power drills or manual tools, and Micaton has the standard bit and torsion bit sizes all covered with sets of 6, 10, or 18 pieces. 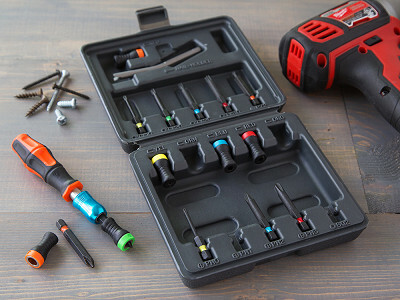 The 18-piece kit also has a magnetic nail-holder that grips nails while you hammer, adding major convenience and a measure of safety, too.